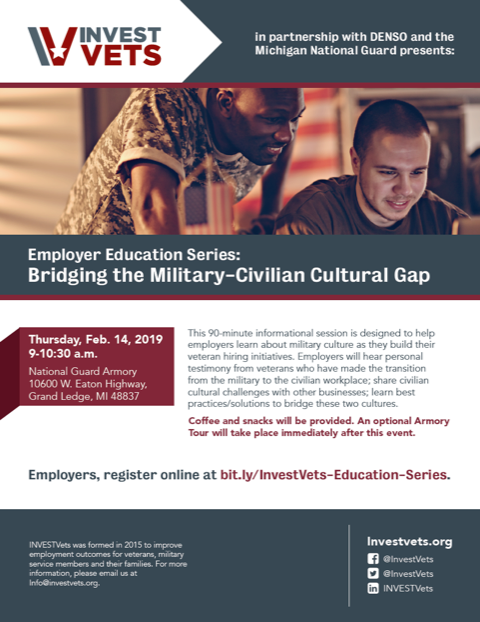 The InvestVets Employer Education Series: Bridging The Military – Civilian Cultural Gap is a 90 minute informational session designed to help employers learn about military culture as they build their veteran hiring initiatives. Employers will hear personal testimony from veterans who have made the transition from the military to civilian workplace; learn and share civilian employers’ cultural challenges from other businesses; receive best practices / solutions to bridge these two cultures. Coffee and snacks will be provided. An optional Armory Tour will take place immediately following this event. Employers can register here for this free event.